Pixar replaced Disney long ago as the undisputed king of animated filmmaking, but for 15 years Disney remained one-up on the upstart, until now. With its 13th major film in production, Pixar is, at last, turning to a female character to play the sole protagonist. And, like Disney’s Mulan, she will turn out to be an inspiration, despite her sassy ways and nonchalance for the breaking of out-dated rules (which rains turmoil down on her kingdom). Billed as its first fairy tale, ‘Brave’ is set in Scotland among mystical castles and forests and stars a princess named Merida. Like Mulan, the Chinese peasant who toppled the invading Huns with her cunning, Merida also embraces her tomboy side as an unruly daughter and accomplished archer. The girl’s character will be played by Scottish actress Kelly Macdonald (No Country for Old Men, Boardwalk Empire). Other voices in the film will be Emma Thompson as her mother, the queen, Craig Ferguson as Lord Macintosh and Billy Connolly as her father, King Fergus. 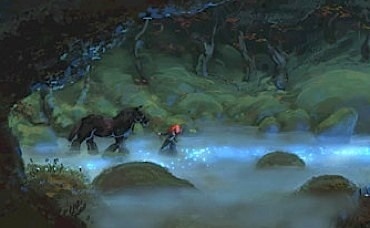 The quest by Merida to set things right for her village, leads her to visit a sage old woman who grants her one wish. Brave, due out in June of 2012, is also the first Pixar feature-length production to be co-directed by a woman, Brenda Chapman (The Prince of Egypt), who originally conceived of the project. Pixar studios, which has earned twenty-six Academy Awards since opening its doors in 1979, was acquired by the Walt Disney Company in 2006 for $7.4 billion, 20 years after Apple CEO Steve Jobs first bought the company in 1986. Pixar’s 12th film, Cars 2 will be released this June.